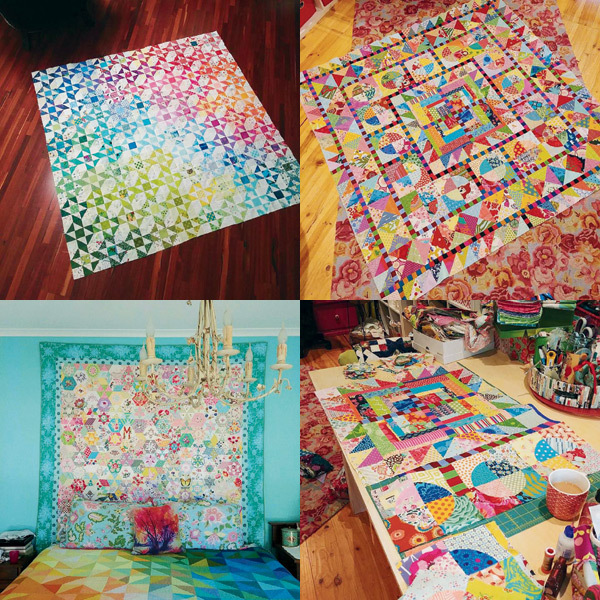 The first quilt I ever participated in was a hexagon quilt for a fundraiser when I was 10 years old in Girl Guides. I thought it was the most beautiful thing I’d ever seen. I did my first quilting class as a young mum in 1992 and knew I had found my passion in life. Over the years, Michelle McKillop has learnt and practised many crafts including knitting, cross stitch, painting and mixed media. “I took an art therapy class for many years and find art journalling and mixed media a really expressive, cathartic process,” she reveals. Michelle’s style is traditional with a modern, eclectic twist. 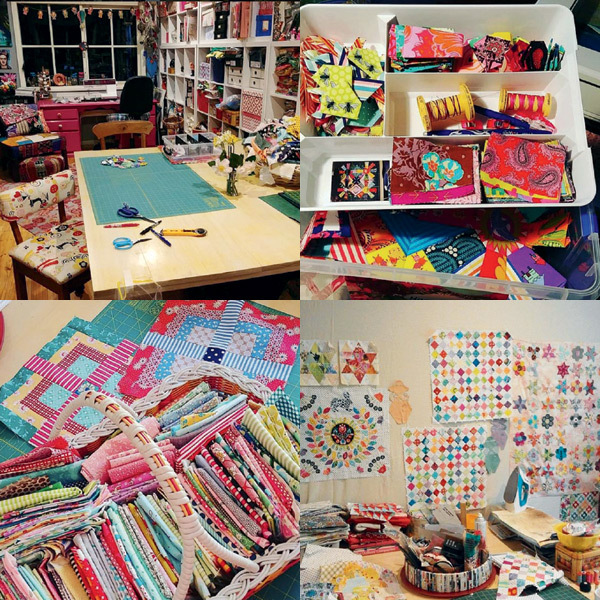 “I believe that all this accumulated knowledge has enhanced my quilting” she says. Michelle enjoys needleturn appliqué and finds machine piecing a meditative process. She practised fine arts painting for several years in the early 2000s and claims the art theory gave her the confidence to draw and sketch, or to simply “follow the line”. Michelle and her husband purchased their first house in Melbourne’s outer east during the 1991 financial recession. It had five bedrooms and at the time they had two children and a third on the way. That unused fifth bedroom eventually became Michelle’s studio. 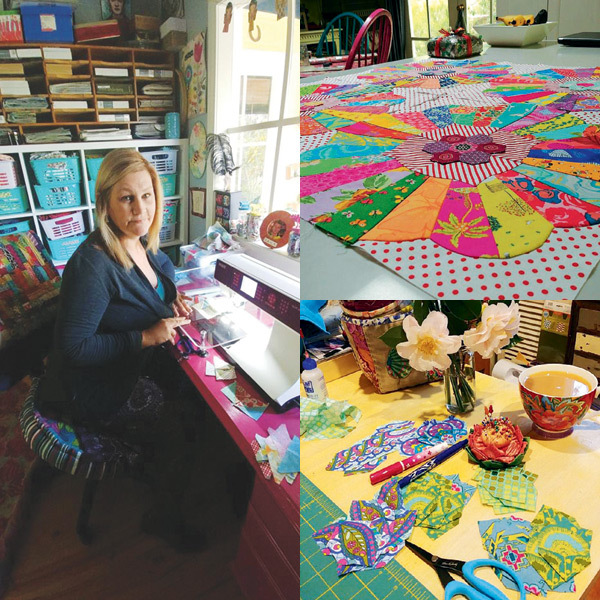 “I was pretty lucky to have that space at a time when my other quilting friends with children were working at their kitchen tables,” she says. 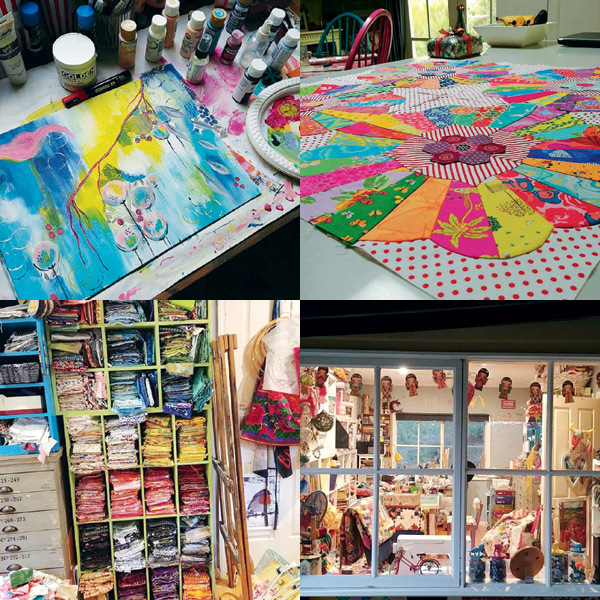 However Michelle’s quilting process is not confined to her studio. She has “a very large free-standing bench in my kitchen which I love to use for hand-basting. I usually put a CD on and baste two or three quilts in an afternoon.” At the beginning of this year Michelle had accumulated more than 40 quilt tops, all awaiting quilting. It is now June (at the time of writing) and “with a concerted effort I’ve whittled that down to only 20” she enthuses. Michelle works on two sewing machines, both Pfaffs. “I have a top-of-the-line Quilt Expressions 4.2 that I bought two years ago, and my trusty 24-year-old Hobbymatic that still sews a beautiful straight stitch. I really enjoy hand-quilting with perle cotton — it gives a lovely patina to a quilt and is relatively quick,” she adds. Michelle began publishing her own patterns around 2008 and shortly after she started teaching at Amitie Textiles. “It was such a great experience and my style was very compatible with the whole Amitie vibe,” she recalls. In 2016 she was invited to become a designer for the Jen Kingwell Collective and her first patterns, Dreamweaver and Spindrift, were released at Spring Market (USA) in May, 2017. They say it takes 10,000 hours of practice to hone your craft and develop your style. As Michelle has made more than 700 quilts in 26 years, one might say she has reached and surpassed this milestone! 1 Your own studio space is great, but a corner of your bedroom or laundry is terrific with some wall shelving and a desk. I like project boxes to contain quilts on the go where I put all the fabrics, pattern, notes and notions for a single project. 2 It is important to learn all the techniques thoroughly before you break them; quilting is a hands-on craft and the more we practise, the better we get. 3 Always, always match your thread content to your fabric content: cotton fabric + cotton thread. Polyester thread is a ‘plastic’ and much stronger than cotton or linen fabrics and over time it will slice through the seams on your quilt. Copyright © Wonderwall 2016. All rights reserved.